You are infringing my human right to infringe your human rights. Tolerating the intolerant is like preaching love to a mugger pointing a gun at your face- you’re gonna get killed. 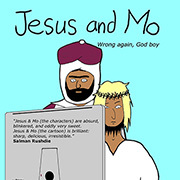 Jesus and Mo should be part of a Brotherhood of Evil Fictional Characters – major members: Darth Vader, Magneto, Khan (from Star Trek 2), Jesus, and Mo. don’t take away might inalienable right to take away other people’s rights! Their absence is better we figure. I suppose it confuses them that programs designed to reduce intolerance and promote diversity awareness isn’t inclusive of bigots. Why the prejudice against spammers? I’m with kiyaroru, spammers are humans too! Except when they’re bots, natch. First they came for the spammers, and I did not speak out because I was not a spammer. Apologies if the following link has been posted before or you have seen it. Richard Dawkins tweeted it half an hour ago. This is funny … it is funny to find out that this is funny …. Been away for a while; got some catching up to do. I see NBH is no longer posting incoherent word salads, just limericks. 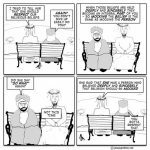 Radio 4 had a decent report a few days ago called “Tolerating the Intolerant”, just in case you thought that Westerners from non-Muslim backgrounds were the only victims. And Anjem Choudhary is interviewed! Britain is lucky enough to have a Society for the Protection of the Prophet’s Honour. From the way they were speaking I’m guessing that the word Prophet wasn’t in inverted commas. Yes indeed, there are two types of people in the work: the type that divides the world up into two types of people and the type that doesn’t – those who believe in “us and them” and those who just believe in “us”.